There were close to 100 members of the Gendarmerie with assault rifles bracketing us on both sides as we walked to the bus. There were three paddy wagons, at least eight officers on motorcycles, and a helicopter hovering above. Streets were blocked off throughout the city to make for a swift transport to the stadium. When we arrived, our mugshots were taken as we held our identification cards. It was about the time that the unmuzzled German shepherd jumped on me while sniffing for drugs that I felt less like a sports fan and more like someone who was being processed for committing a crime. It was these same security measures that led to Marseille fans boycotting the match in 2010. Without Marseille fans to fight, PSG fans clashed among themselves that night, leading to the death of Yann Lorence. Inside the stadium, the hate between the two sets of fans was immediately apparent. Once we were seated in the visitors’ section, a crowd of Marseille fans rushed to the front row of seats. They chanted the usual obscenities you hear at sporting events and followed it up by trying to toss water bottles and coins at us; they might have been successful had it not been for the net that separated our section from theirs. During the introductions, the Marseille supporters group in the south stand unveiled two orange-and-black banners of Che Guevara that had to be at least 50 yards long. Once the whistle signaling kickoff blew, all attention turned to the field for the match against the two teams at the top of the table. PSG looked sluggish at the outset and Marseille quickly tried to capitalize, with Andre-Pierre Gignac failing to find the target with an early effort. 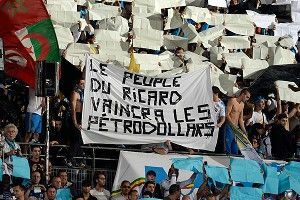 Before the match, the PSG fans chanted “un big mac pour Gignac” but the burly forward instead chose to feast on the opposition defense. His first goal came when PSG cheaply gave away the ball near midfield and Jordan Ayew fed Gignac, who wrong-footed Christophe Jallet before beating Salvatore Sirigu at his far post. PSG answered almost immediately through Zlatan Ibrahimovic, whose tae kwon do–like flick found the roof of the net to bring PSG level. Ibrahimovic scored his second on a swerving free kick from about 35 yards to give PSG the lead. But then sloppy defending gifted Gignac a free header from a corner, leveling the match at 2-2. The second half lacked the bite of the first 45 minutes, as Carlo Ancelotti used two of his three substitutions to bring on defenders to secure a draw. This match, coupled with the loss against Porto in the Champions League, gave an accurate picture of where PSG is as a team. They look good enough to win Ligue 1, but something else is needed if they want to progress in the Champions League. They were overrun in midfield against two teams that attacked them directly, and the defense is still below par, especially given the money spent on Thiago Silva. Worryingly, the team is overly dependent on Ibrahimovic. In almost every match this season, Ibrahimovic has cast an exasperating look to a teammate who didn’t play the ball where he wanted it or didn’t play the pass soon enough. These things happen all the time with any other team, but the frequency that they occur with PSG has to do with the gulf in class that exists between Ibrahimovic and his teammates. At some point this season, someone else needs to step up besides the Swede. Too often players go missing, and Sunday night was no different. Javier Pastore once again lived up to his reputation as a player who is, at times, a bystander in the biggest matches. Against Marseille, Pastore appeared genuinely uninterested and played so poorly that he was substituted at halftime. At some point the club may choose to cut its losses, but for now it’s hard for Ancelotti to keep Pastore on the bench because his other options in attack are equally unreliable. Marco Verratti also had a week to forget, but at 19 years old, the growing pains are expected. His talent is obvious but so too is his recklessness, which led to his yellow card for a dangerous slide tackle. These flaws make PSG an interesting team to follow. There’s a fool’s gold feeling that’s starting to settle in. When they play weaker sides like Bastia and Sochaux, they look like world beaters, but in a week that was billed as la semaine de la vérité, PSG finished with more questions than answers. After the match, we were made to wait at least an hour for everyone to clear the stadium. Most of us had been together for more than 12 hours and were ready to head home. There was, thankfully, no violence between any of the fans, and the closest thing to a scuffle that happened was the mosh pit that ensued when Christophe Jallet threw his jersey into the visiting fans’ section. Still, the Gendarmerie continued the dog and pony show, escorting us to the airport in the same manner they brought us to the stadium and waiting in the terminal with us — riot gear, rifles, and all (even though we were the only ones there) — until our flight departed to Paris.